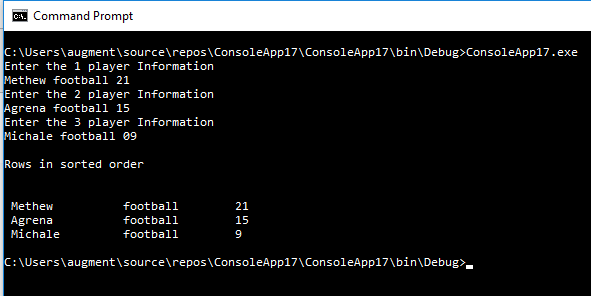 Write a program that allows you to produce a table of Football or Hockey teams. The table should also include games played and points. Attempt this program with some argument passing. For higher grades attempt below procedure Improve the array by sorting it by points. For example, the team with the highest points should be at index 0. Go to File, New -> Project, select window Classic Desktop ->Console App (.net Framework). Create a table and mention the column name in the table. Insert the value in the table. Sort value in DESC order by point.